Set in the wide sweep of St Ives Bay, 3 miles of golden sands, stretching from Porth Kidney Sands on the west side of the treacherous mouth of the River estuary, past Black Cliffs, along the Towans as far as Gwithian in the far west with the magnificent backdrop of Godrevy Lighthouse. Gwithian Sands attracts the extreme sports fraternity:-kite surfers, land sailing, blokarts and speedsails. A zoning system is being trialled banning all wind powered activities as well as horse riding from the parts of the beach most popular with families in the summer months. Lifeguards operate in season keeping a watch over the bathing areas. It can not be stressed on no account should you swim between the Red River and Godrevy Point given the dangerous currents as the tides sweeps twice daily through the narrow channel between the Point and the Lighthouse, or at the mouth of the Hayle River. Surfing Holiday Cornwall-in season wet suits and boards are for hire from the Car park by the Sunset cafe. Surf tuition is available from professional instructors at the local surf academy. Godrevy Lighthouse with its distinctive white octagonal tower was erected in 1859, and automated in 1939. Did you know it was the inspiration for Virginia Woolfe's novel "To The Lighthouse"? Can you see the now disused former keepers stone cottages to the left of the lighthouse? Walk west along the Cornish Coast around the grassy headland toward Portreath along some of the highest cliffs in Cornwall, with names such as Hells Mouth. Seals sometimes seen under Navax Point though elusive and preferring rough seas. Keep back from cliff edges at all times. Beware of the rip tides. Behind the towans (Cornish for sand dunes) are several Cornwall Hayle Holiday Parks, the perfect place for a self catering beach holiday in a chalet, bungalow, lodge or caravan. Hayle A hundred and fifty years ago the town was at the summit of its industrial glory. Harvey's massive foundry complex dominated, producing steam engines for use not only in Cornwall's mines, but also mines the World over. Just north of the town was Wheal Alfred Consols, producing tin and later in its working life copper. The mine is well known by mineral collectors for fine specimens of pyromorphite. The port served the Central Mining Belt exporting copper ore to the smelters in Wales, importing timber props and coal for the mine engines. What is now an important wildlife habitat, Carnsew Pool, was constructed at this time, the sluices were opened to keep the treacherous harbour entrance free of sand. Indeed older locals can remember back to the 1950's when the harbour was still a bustling place the sluices were still in regular use and the channel dredged. Hundreds of people were still employed by 'The Docks', with imports of coal and timber, exports of scrap metal. Warnings. Hayle Bay can be treacherous and should only be navigated by experienced skippers. The Hayle River, the River mouth and the open sea beyond the Red River toward Godrevy Point are notorious for their rip currents and undertows. On no account should you enter the water in those areas. Hayle Towans and Gwithian Towans beaches are popular with visitors, with lifeguards in Season. Good Beach Guide. 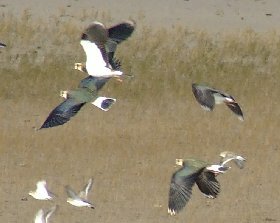 The upper reaches of the Hayle Estuary (the most south-westerly estuary) in the UK are a good place to watch birds in autumn and winter. Wading birds such as dunlins, curlews and grey plovers spend the winter here as do often thousands of migrants, from widgeon, to teals and shelducks blown west by cold easterly winds. 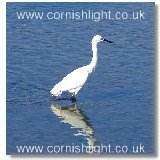 Little Egret are resident and you may be lucky to see one of these so beautiful birds. Visit Paradise Park Wildlife Sanctuary Collection of rare and endangered parrots plus miniature railway, and gardens. 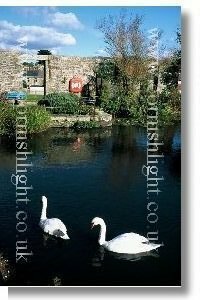 Take a day trip to Lands End or St Michael's Mount Visit St Ives.